The group of Al Ahly fans behind Wednesday's attack on the Egypt Football Association are planning to disrupt the staging of this weekend's Super Cup. Earlier this week, hundreds of fans were involved in the incident at the EFA headquarters, which left the building badly damaged. Fans are demanding changes to the way the sport is run. They were due to meet in Cairo, before travelling to Alexandria - the venue for Sunday's Super Cup, involving Ahly and ENPPI. They are also angered by plans to re-start the league on 17 September, before the conclusion of a trial concerning the riots at Port Said earlier this year. More than 70 fans died after Al Masry supporters invaded the pitch at the end of their match with Al Ahly on 1 February. 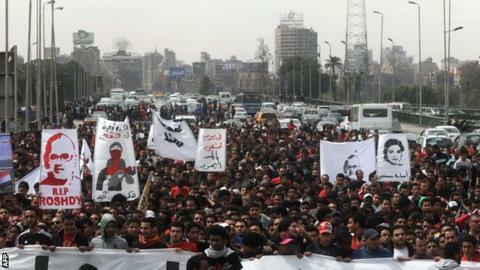 Ahly followers claim they have remained calm for the past seven months, marching peacefully. Now, though, they have stepped up their campaign and laid down a list of demands, among them the resignation of the EFA and Ahly boards, plus a complete overhaul of the football system in Egypt. When football does resume, they insist that fans be allowed in as spectators. Sunday's Super Cup will be played behind closed doors. There are also calls for the Ministry of Interior to stay out of football. One fan spoke to BBC Sport on condition of anonymity. He said: "We don't want police again in stadiums. Private security companies is the alternative and no football without fans." Ahly Ultras believe they have the backing of supporters throughout Egypt. The fan added: "Ismaily Ultras fans (Ultras Yellow Dragons) announced yesterday their full support to our demands in an official statement. "Others have agreed, though not officially. I believe that everyone wants to start a new era in football - and sports in general - and that won't happen unless we get rid of the old sport regime."